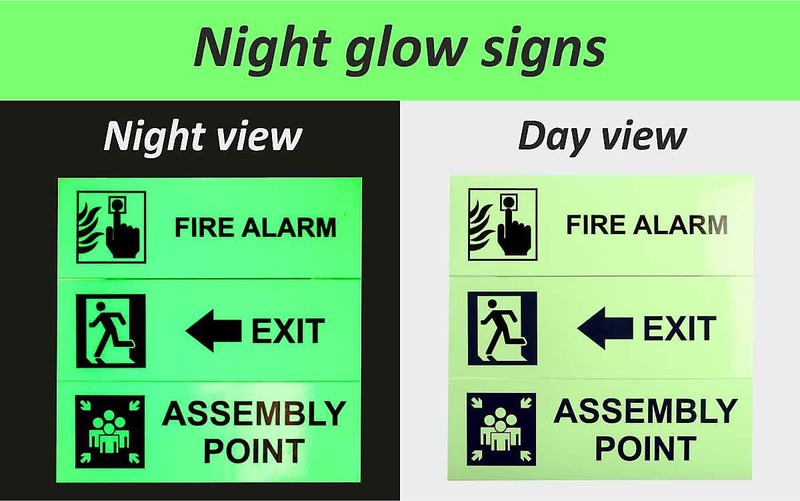 Have you ever wondered how some safety signs have a greenish eldritch glow, especially when viewed at night? 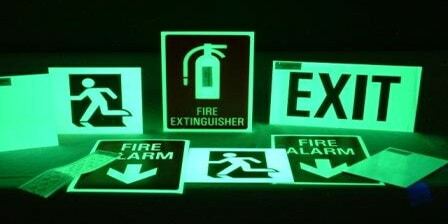 These fire safety and exit signs are pretty prominent in movie theaters, hotels corridors, offices, shop floors and other areas which are dimly lit. What I’m talking about, are known in the print industry as ‘night glow prints’. These prints do not have any light source like LEDs or bulbs. Yet, they emit light in the absence of electricity. 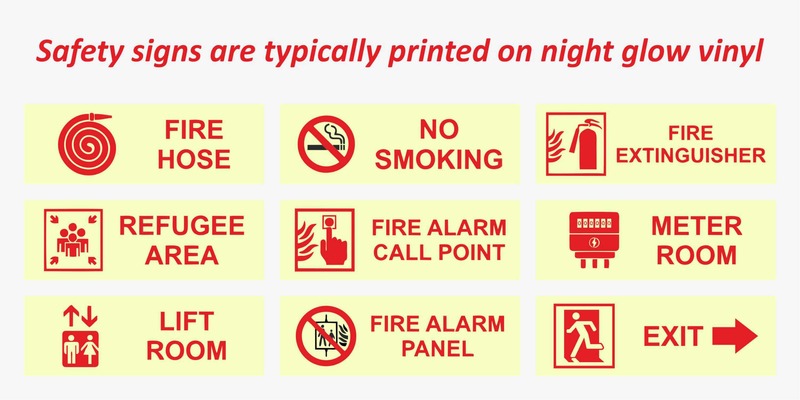 Night glow prints are widely used to create emergency exit and fire safety signs. In the event of a fire, electrical supply is one of the first things that stop functioning. Visibility is reduced. People trapped in dark, smoke filled rooms need help finding the nearest exit. In the absence of power, an electrically lit sign is of no use. 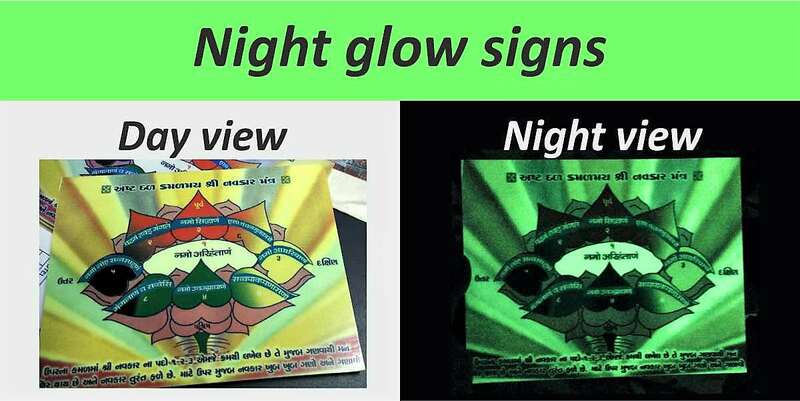 So we need glow in the dark prints which are easily visible and do not need electricity to work. You may recall the term ‘phosphorescence’ from high school science. Wikipedia describes phosphorescence as a process in which energy is absorbed by a substance and then released slowly in the form of photons of light. Phosphors have this unique quality which makes it emit light when energized. In other words they absorb and store energy. This pent up energy is then released in the form of visible light. Since this emission of light happens at a relatively slow rate. The process continues even in complete darkness. Hence, when viewed in the dark, we experience phosphorescence or light generally seen as a greenish glow. The thing to remember is that the phosphors need to be first exposed to light. They need to be charged. This arrangement works perfectly for night glow signs. The prints look like regular signs or posters when viewed in the day or in normal light conditions. 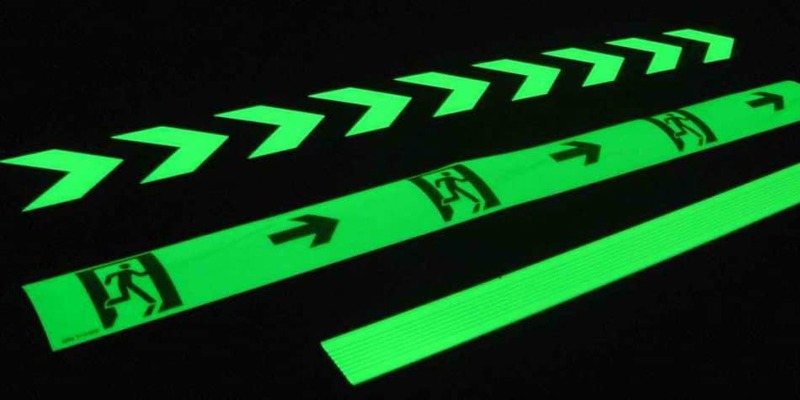 At nightfall or in times of power failure, the glow-in-dark signs continue to shine and remain visible. At Orchid Digitals, Pune, we have special printable vinyls coated with the above mentioned, light emitting phosphors. We use our high resolution eco-solvent photo printers to render images on these vinyls and lo behold, you have signs and photos that shine in absolute darkness. The printable roll has a very light green hue. During the day, the print looks like any regular vinyl sign (except for the light green background). But switch off the light, or let night fall and you will see a strong green glow emitted from the print. Eventually, the prints will dim and go dark. Depending on the amount of the light absorbed, these prints will keep radiating light for, anywhere between 45 minutes to a couple of hours. You then need to ‘charge’ the print once again. In an outdoor area, the sun charges the sign board during the day. In an enclosed location, the night glow print will absorb light from sources like incandescent bulbs or florescent tube lights. 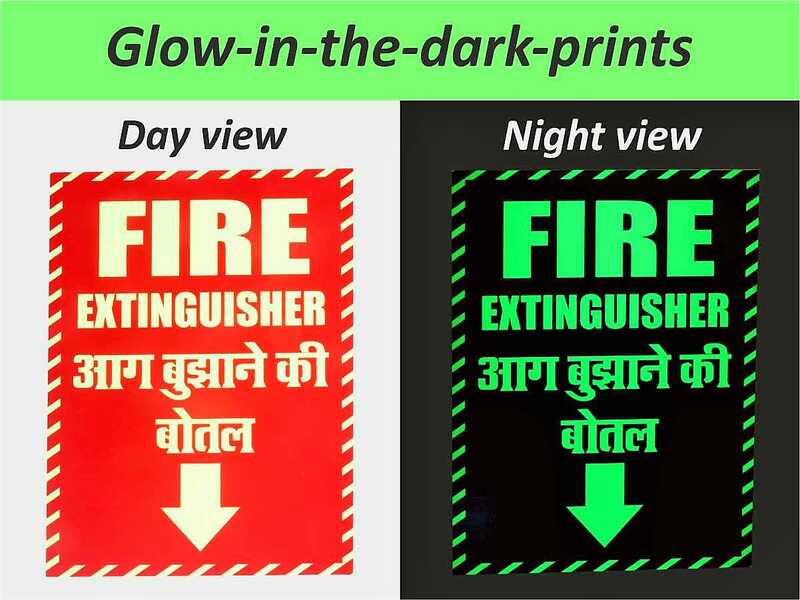 Emergency exit signs, fire alarm signs, emergency meeting points and similar safety signs are some of the main applications of glow in dark prints. But people also print funky or psychedelic looking photos on the same. These prints look like regular posters during the day. But in the darkness, they jump out and garner a lot of attention!